This lesson will focus on Lace. We will cast on using a cast-on rag and ravel cord. Then, do the lace pattern of your choice in the tension swatch and then we will use another cast off to finish the swatch. Remember, if you are using a Standard gauge Brother/KnitKing machine with ribber attached, please have your lace knittting hang in front of the ribber. This helps to avoid dropping stitches when transferring with the lace carriage. Use Knit-Cro-Sheen or something similar that has a hard finish. Select the last 12 needles on the far right of the machine. e-wrap and Knit one row to the left. 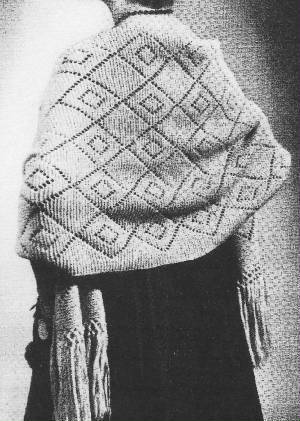 * Edge decrease the last stitch on the rightand pull the first empty needle on the left all the way out (creates an automatic wrap)and then knit TWO rows*. Repeat from * to * across the full bed of the machine....this makes a cast-on rag of 100 stitches, so to make it wide enough for the full width of the machine, don't bind off the strip. Instead, move the 12 stitches on the machine back over to the right side of the machine and continue across the machine bed one more time. Then, after the last decrease, increase, knit ONE row, and bind off. You will now have a bias strip with a total of 200 loops. So, now that you have your cast on rag made(or you may use a piece of scrap knitting), hang the cast on rag onto your needles for your swatch, usually 60 stitches for standard gauge machines, pulling one needle through each loop. Beofre you start hanging the cast on rag, move your carriage to the Left side of the bed. As you hang the rag onto the needles, pull the needle into holdd (all the way out) and then when you have all the needles in the rag for your swatch, put your ravel cord into your carriage and knit one row. 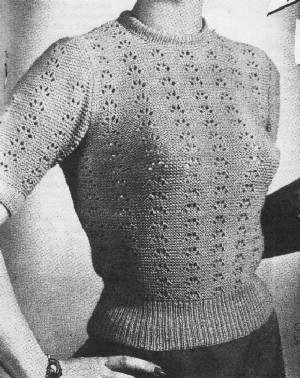 You are now ready to knit our swatch. Lace: for those with electronic or punchcard machines chose a lace pattern and follow the instructions in your manual for knitting the lace. Don't forget to mark the swatch so you are able to measure it. Also, don't forget to mark the swatch with eyelets after the lace swatch is finished to tell you in the future what tension you used. For those of you without patterning facilities, we will be doing hand transfered lace. As well, those of you with patterning facilities, also need to try the hand transferred lace, so separate your swatch with some waste yarn and then do another swatch using hand transferred lace. Copy and paste these urls into your browser! The above is a detailed hand transfer pattern. Make a chart for yourself depicting the graph you wish to follow or use the following charts one from a magazine and the other hand done up. Basically, you make all the transfers on one line at once, and then knit 2 rows with the carriage and then make the next line of transfers. If you were using a lace carriage it would only transfer in one direction and would transfer the opposite direction on the return of the lace carriage. Sometimes it takes many passes to complete all the transfers, whereas hand transfering is all done at once. If you are transferring a couple of stitches (one from each side) to a central stitch, please make sure you transfer consistently, another words, if you start by transferring the L stitch first, continue doing it this way. The following picture and graph are for hand transferred lace used as a stole....looks very effective. The next picture is a ladies pullover also done with hand transferred lace, and is followed by the graph done up by hand. Hope it makes sense. Follow the graph shown below, remembering to always knit 2 rows between each set of transfers. After doing your second section of your swatch, now insert a couple of rows of waste yarn, and then continue with your main yarn, inserting your eyelets to mark your tension. When you have done several rows of plain knitting, its time to take the knitting off the machine. This time we'll take it off with the double eyed needle. COR. Cut the yarn with approx twice the length as the width of your knitting and thread one end of the double eyed needle with this yarn. Pull the needle on the far R to hold, place the eye of the double eye'd needle into the hook and pull the needle back dropping the stitch onto the needle. Now do the same with each and every needle. You will be transferring all of the stitches to your needle. Pull the yarn through these stitches as necessary. When you have all the stitches off the machine, secure the yarn as necessary to keep the stitches from dropping.